According to Isagenix, their cleanse is “a combination of intermittent fasting with herbs and vitamins that support detoxification — and provides surprising health benefits. One of the first things that people notice when they embark on Cleanse Days is the weight loss. Studies on intermittent fasting have shown that it is just as an effective approach for weight loss as compared to cutting calories (1). In one study, overweight women who fasted intermittently for six months lost more weight than women who restricted their calories each day (2). I use Isagenix products for convenience, especially after a strength training workout. Initially I started out using a whey protein shake based on my reading about whey benefits. If you are vegan or vegetarian, an excellent plant based meal replacement option is Vega One. Generally, I prefer real food over a shake, but after a workout I want to have the best possible combinations of ingredients to help me build muscle. I have tried a variety of whey proteins and one of my favorites is Isagenix based on taste and the nutritional value of their product. I think it is especially useful when you need to cleanse your body. This will help you to get on the right track, which is what I like about the Isagenix 9 day cleanse. If you need to lose 20 or 30 pounds, this might be a great start or supplement. It would seem that after a day of not eating, you would be more likely to gorge on food when it is reintroduced. However, evidence suggests that when intermittent fasting becomes a habit, less food is commonly eaten during normal calorie days (3). Some theories imply that this could be due to shrinking of the stomach on fast days so that you are less likely to overindulge at meal time. Along the same concept, Isagenix program users proclaim that cleanse days practically erase any previous food cravings they used to have. Cleanse days are shake days, the days that I used cleanse for life and an Isalean shake. I can verify that I did not crave more than what was suggested on the Isagenix meal plan. Personally, I like the berry taste cleanse for life. Insulin sensitivity—how well insulin does its job of ushering glucose in the blood (after eating food) into the appropriate body tissues where it is used for energy—also looks to be “reset” by fasting. One study showed that healthy men who fasted for 20 hours every other day for 15 days had increased rates of glucose uptake, signifying improved insulin sensitivity and better blood sugar control (4). Even with a cleanse, you need to keep going with your new healthy habits. An Isagenix 9 day cleanse will make a big difference when you adopt new healthy habits and a new lifestyle. Eat moderately sized healthy meals, walk, run, jump rope, swim or do the elliptical for at least 20 minutes a day. Do strength training, avoid processed food and stick to real food, then you will see and feel real body transformation. You also could lose 75 pounds in 6 months like this former obese mand. What is the Isagenix 9 Day Cleanse? The Isagenix 9–day cleanse actually lasts for 11 days. 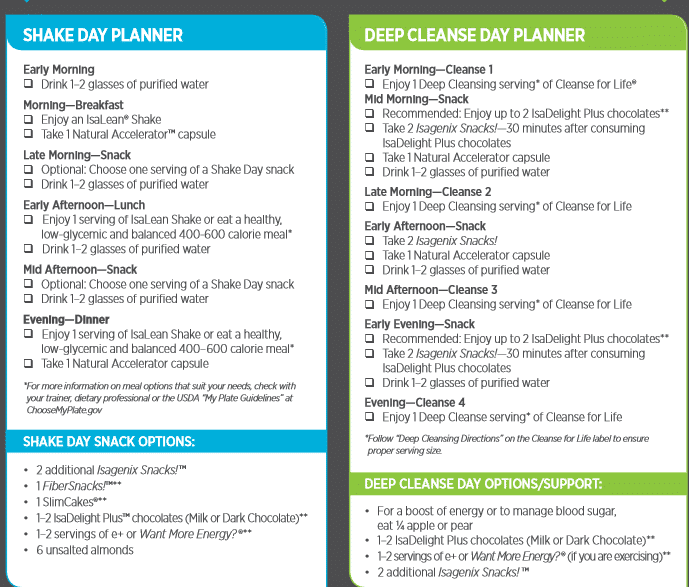 … Then, the next two days are “cleanse”days where you virtually eat nothing at all. You drink a lot of water, the Cleanse for Life serum (it's like a shot) multiple times a day, and in between, you can have Isagenix Snacks to curb your appetite. 1. Eshghinia S, Mohammadzadeh F. The effects of modified alternate-day fasting diet on weight loss and CAD risk factors in overweight and obese women. J Diabetes Metab Disord 2013;12:4. 2. Harvie MN, Pegington M, Mattson MP et al. The effects of intermittent or continuous energy restriction on weight loss and metabolic disease risk markers: a randomized trial in young overweight women. Int J Obes (Lond) 2011;35:714-27. 3. Varady KA, Hellerstein MK. Alternate-day fasting and chronic disease prevention: a review of human and animal trials. Am J Clin Nutr 2007;86:7-13. 4. Halberg N, Henriksen M, Soderhamn N et al. Effect of intermittent fasting and refeeding on insulin action in healthy men. J Appl Physiol 2005;99:2128-36. First, I tried out their Isalean Pro meal replacement shakes. When I did, after 2 weeks, I was feeling great, so I became more open to the idea of doing a test drive of Isagenix products and Isagenix cleanse days. Another reason, is that as I became more familiar with their philosophy, my interest was piqued because they have similar views as to focus on real foods, strength training and avoiding sugar and processed foods. As a result, I decided to give the Isagenix cleanse for life system a shot, why not, what did I have to lose? There are two options, the 30 day Isagenix cleanse and the 9-day cleanse. I chose the Isagenix 9-day deep cleansing system and this is my review. This was my experience several years back with the Isagenix 9 day cleanse to jumpstart fat loss, especially for individuals like myself who have battled obesity for so long. I got sloppy and too confident after my initial 75 pound weight loss in 6 months back in 2012. Many of us who have lost weight, end up regaining it. I was no different. I thought I had the roller coaster ride of weight loss licked. So, I stopped weighing myself daily. And the result was regaining over 30 pounds in just 6 months. Because I stopped doing a daily weigh on the scale. When people ask ‘how often should you weigh yourself'? To me there is no question the answer is every day. I needed a jumpstart for weight loss and learned about the Isagenix 9 day cleanse. After four days on the Isagenix 9 Day Cleanse. I could see and feel results. These last 2 days were cleanse days. Therefore, you have the the Cleanse for Life® powder and lots of water 4 times a day, with several of the Isagenix Snacks . I mixed up 2 scoops of the Cleanse for Life® powder in 8 oz of cold purified water with added ice. Honestly, it tasted great and left me feeling refreshed. I am the last person to believe that I could go for 2 days without food just by drinking the Cleanse for Life® and taking the Isagenix snacks a few times a day. But I was fine during the cleanse days. After 4 days into the Isagenix 9 day cleanse – I was 5 pounds down in scale weight without feeling too hungry or uncomfortable. The final results was 7 pounds down. It is not necessary to use any specific whey shakes for weight loss. You do not need Isagenix or any other weight loss shake or product to teach you the basics. The path to weight loss is something that you already know intuitively, eat real food, eat much less processed food and start moving. You can get into great shape with or without meal replacement shakes or group weight loss initiatives. However, a meal replacement shake is convenient after a strength training workout like deadlifts. When you start losing weight, consider strength training. And if you do, I suggest to start with deadlifts, because they are a full body exercise and even someone a bit overweight can do them. Deadlifts will help change your body from fat to fit. All you need is one great beginner deadlift workout and a beginner deadlift program.